SalutetoSpouses.com is the home of Bryant & Stratton College Online's Salute to Spouses scholarship. 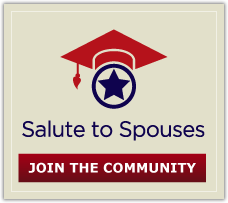 Sponsored by Bryant & Stratton College Online's military relations department, SalutetoSpouses.com has expanded to a go-to resource for education and career news for military spouses. With a history of successfully serving the educational needs of military veterans, retirees, active duty personnel and their families, Bryant & Stratton College Online created the Salute to Spouses scholarship after the U.S. government temporarily suspended and later reinstated a restructured MyCAA. Spouses of active duty U.S military personnel are eligible to receive $6,000 towards a Bryant & Stratton College Online degree with the Salute to Spouses scholarship.The Salute to Spouses scholarship program is an opportunity for military spouses to advance their education and become more competitive in the modern job market. Bryant & Stratton College Online is proud to support our troops and you- the spouses. We recognize the new eligibility requirements the restructured MyCAA program has in place and are proud to offer the extra educational support to all eligible spouses of active U.S military service members. We understand that when a spouse serves in the military, the whole family does too. The flexibility of our online degree programs cater to the hectic lives of military families. As long as you have access to the internet, you can work on your degree from anywhere in the country or world; in fact some of our students are even active duty soldiers working on their degrees in Iraq. For more than 155 years Bryant & Stratton College has been preparing students for professional careers through both campus programs and online education. The College's associate's and bachelor's degree programs are available online and at 17 campuses across four states. Currently, Bryant & Stratton College Online offers four online bachelor’s degree programs, eleven online associate’s degree programs and ten online certificate programs in a variety of fields including business, criminal justice, financial services, healthcare, human resources and information technology. Bryant & Stratton College is regionally accredited by the Middle States Commission on Higher Education (MSCHE). The MSCHE is an institutional accrediting agency recognized by the U.S. Secretary of Education and the Council for Higher Education Accreditation (CHEA). As a member of the Service members Opportunities College (SOC) consortium*, Bryant & Stratton College is also an approved institution for the training of U.S. veterans and their family in accordance with the U.S. Department of Veterans Affairs. We are proud to be CLEP, DANTES, ECE and other SOC Colleges approved. *The Bryant & Stratton College-Virginia Beach campus is also a SOCNAV and SOCAD consortium member. We are military wives. We are harried mothers in the middle of the commissary, wrangling our children. We are wives who sleep with the phone by our side in case our husbands get a few minutes to call from the front lines. We are still trying to balance family and a career and fill in for a husband who can never be home as much as he wishes he could. We know that no matter how much we love a job, or a community, we'll be leaving it in a few short years to move to the next duty station. We are military wives. When officials at Bryant & Stratton College Online told us they wanted to help military spouses achieve their higher education and career goals, we wanted to be part of that effort. The writers of Salute to Spouses aim to be the online source for education and career news for military spouses. We have completed coursework late at night while worrying about a deployed husband and rocking the baby to sleep. We've hit the pavement in each new duty station in hopes of landing a great job. We've felt the despair when our best laid plans fell flat. Let us help you on your journey to earn your degree or navigate the corporate ladder. We are military spouses. We not only understand, we're also here to cheer you on. Join us.